A couple poses for their wedding portrait at the studio of A. Heron in Montlucon, France. The bride and groom are formally dressed. Note the groom’s top hat (he’s holding it) and the bride’s long veil. The groom is shorter than the bride and unlike many other wedding photos of the era, the photographer didn’t attempt to hide the difference by placing the groom on an elevated surface. 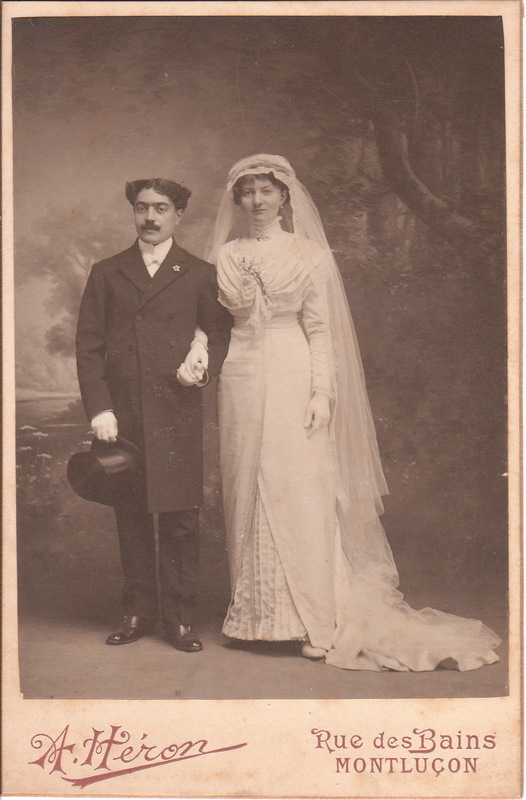 Another difference between this image and other wedding portraits of the era is that the couple in this image are holding hands. Apparently, they were not ashamed of public displays of affection. The lack of fear of photographing intimacy might reflect a difference of the French and American cultures at that time. Preliminary research yielded no information about Monsieur Heron. Montlucon is a town in central France on the Cher River.